How Do I Play Videos using Kies Air? You can play videos stored on your connected device or added to your Kies library. To play videos, click Videos below your device name or Library in the left panel. Double-click the video you want to play. NOTE: If you do not see the device's name or Library in the left panel, you may be running Kies in Lite mode. Click View > Switch Mode > Normal Mode or click the mode shortcut in the top-right corner of the window to return Kies to "normal" mode. 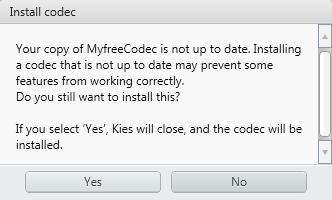 If you have not already done so, you may be asked to update the MyFreeCodec app. This app lets you play a wider range of video formats. If you see the message below, click Yes to update the MyFreeCodec app. Kies will close and install the codec. Restart Kies manually after the update is complete. How Do I create, edit, and manage my contacts using Kies Air? What can I backup and recover from my device using Kies? How to back up or restore data by Kies 2.6?